Lip balms are one of the most commonly used cosmetics by men and women. Some of us are addicted to them and can't go a day without them. Have you ever wondered what ingredient goes into your lip balm? 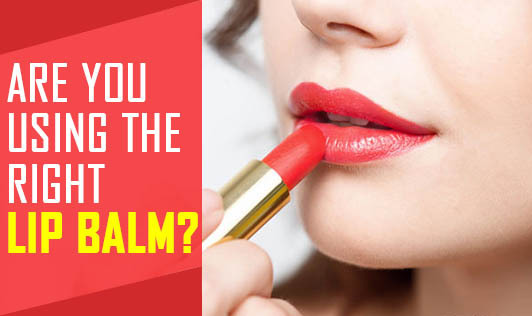 Are you using the right lip balm? Is it safe for you to use it every day? Lip balm often contains beeswax or carnauba wax, camphor, cetyl alcohol, lanolin, paraffin, and petrolatum, among other ingredients. Some varieties contain dyes, flavor, fragrance, menthol, phenol, salicylic acid, and sunscreens. There are always rumors that lip balms cause cancer, darkening of the lips etc. There are some facts on lip balms here. Too much usage of lip balm causes dry lips. As the lips dry, you tend to apply more. . Some of the ingredients in lip balms can lead to a tendency to use the product more frequently by prolonging the chapped effects. Avoid products with phenol, menthol or salicylic acid. Balms with these ingredients may cause a tingling feeling. This sensation is actually a sign of the protective layers of dead skin on your lips peeling off. Also avoid flavored lip balms. Use lip balms that have petroleum jelly in it. Petroleum jelly avoids chapping of lips and keeps it moisturized for a longer time. It is also true that most of you are attracted to lip balms because of its chocolate and strawberry flavors. Flavors create addiction. A plain lip balm without any flavor can work far better that the flavored ones. Also, remember that most of us are attracted to lip balms based on the company that manufactures it. This is just a marketing strategy. Keep it plain and simple and it will work well for you.